Rotofugi Forums • View topic - The Rotofugi Forums Are Open! 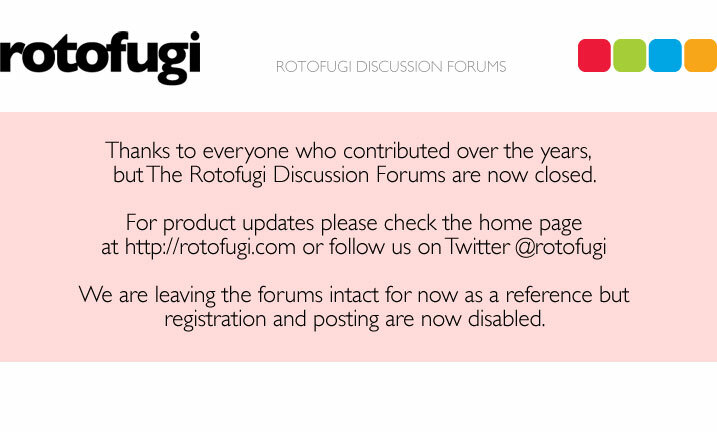 < Other Announcements ~ The Rotofugi Forums Are Open! We've kinda dragged our feet setting up forums, but we're ready to go now! We'll be posting info about upcoming products and shows on a fairly regular basis, but there is nothing sadder than a forum without much activity on it, so now it is up to you to make this a cool place to hang. Have fun. The template for the forums is called Conundrum and comes from designer/programmer Mike Lothar: http://community.mikelothar.com/portal.php. We don't know Mike, but we sure like his work. The toys appearing in the header at the top of the page are copyright their respective creators/manufacturers (l-r): Teddy Troops by Flying Fortress for AdFunture Workshop, Mad-L by Mad for Wheaty Wheat and Qee by Toy2R. And finally, thanks to everyone who has shopped with us (both online and at our store in Chicago)...you're making Rotofugi a success story, and for that, we are very thankful. Finally, let us know if you think there is any way we can improve these forums. We like feedback. Last edited by rotokirby on Thu May 05, 2005 10:32 am, edited 1 time in total. ...and if you hurry you can be in the top 10 of the memberlist...so when we have a 1,000 members on the forums you can RULE OVER THEM! I WILL RULE OVER THEM!! Edit: I don't, however, see where it says what member number you are... What's up with that, Kirby? Hey Zook, go to the Memberlist for your number... you made it into the lucky 10 by just a hair at number 9. Joined: Tue Feb 15, 2005 12:24 amPosts: 13Location: Mill Valley, Ca. whoa kirby. you did an awesome job cleaning up! Woo-hoo, 50 members in our first week! Yeah, baby. Tell your friends all the cool people hang out on the Rotofugi Forums! Seriously though, thanks to everyone who's posting...good vibes! good choice on the platform! phpBB is one of the best open source forum codes out there. You may or may not have noticed some downtime this morning. I apologize for the inconvenience if you were trying to check out the forums. For the second time in the last few months our boards were hacked, although both times the theme files were the only thing to be altered. Tired of fixing this, I spent this morning upgrading phpBB2 to the most recent version which has some security patches that will hopefully stop any future problems. So, sorry for the service interruption. Carry on. i'm number 108. one HUNDRED and eight! and i have a lot more posts than six of the top ten members! hmph. hmm, i think i should be bumped up for my board loyalty and quantity of posts. OR given a cool title, though i'm not sure if you'll be giving titles when a person hits a certain number of posts? some forums do that. it's kinda fun. gives us something to shoot for, ha. i love this board set-up, btw. nice, clean lines. colors are easy on the eyes. very nice job, guys. Alright so im late for the party... and I aint got no booze, but im here at least Hello everybody I look forward to postin aload of rubbish so as not to dissappoint u.